Years back, during my schooling my best buddy who is a native of Karnataka used to bring this dish for lunch and I still remember the way I used to crazily eat it. :) And since then, we have been making it at home regularly and all of us truly relish it. Cook dhall and rice together in pressure cooker by adding 6 cups of water. 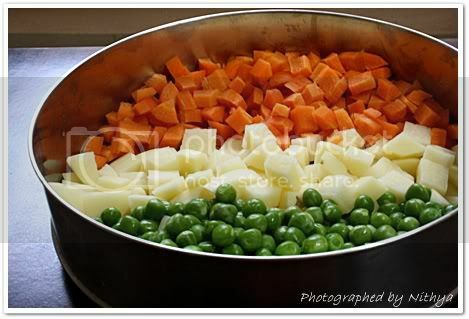 Dice potatoes and carrots into small pieces and pressure cook them along with peas. Fry all the masala ingredients except coconut in one tsp of oil till they turn light brown. Now add the coconut and fry for just a minute and powder it. Heat oil in a heavy bottomed vessel and fry the peeled onions for few minutes. Add tamarind extract to it and boil till the raw smell goes. 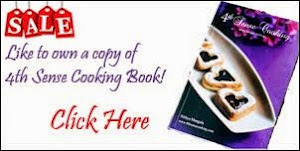 Mix salt, asafoetida, cooked vegetables and powdered spices to it. Now add the cooked rice mixture and mix well till everything blends. Heat ghee and fry the cashew nuts and garnish it on top of the bisibelabath. Gorgeous photos, love all of them. Of course, BBB is my fave dish as Kannadiga myself. Looks mouthwatering. I make sambhar rice without the whole garam masala! I hav eto try adding those and try! 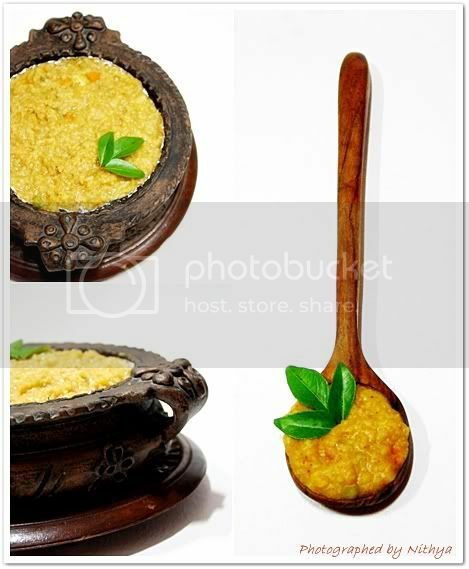 Looks so nice,and the serving bowl and laddle look authentic! hey mouthwatering bisebalabath da ..
Lovely presentation nitya n nice clicks. 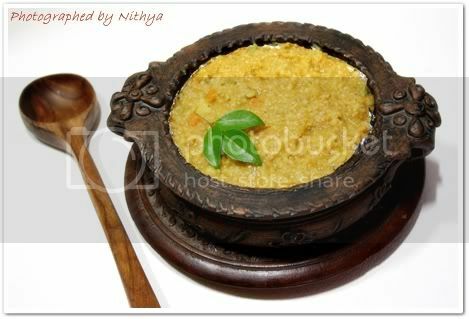 Droolworthy sambar rice NIts..Looks super delish!! wow what a lovely presenatation.the serving pot superb..i am really happy to see such a nice presentation. That is so authentic and traditional looking - love the pictures and the presentation! Keep up the great work. Lovely clicks dear..nicely presented, i want a promise from u? I love bisibelabath so u got to make this for me when we meet..ok? Nithya, BBB looks really awesome ans so as your photography. Very traditional urli is my eye catcher ;) can I get more info on that. hey nithi iam going crazy on ur recipes and photography, u r tooooooooooooooooooooooo gud at it. Wat a comforting food, my favourite!! 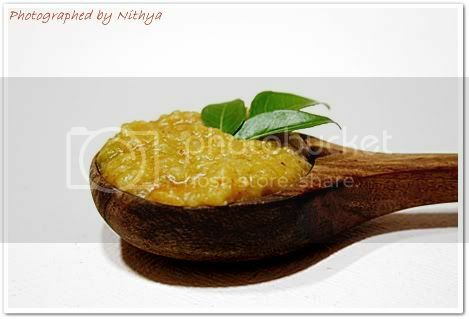 awesome clicks Nithya..
is this kinda vegetable khichdi ?? Bisibelabath looks yummy!! Love the presentation and pics, Nithya..That bowl looks beautiful! Oh I love bisibelabath and urs looks mouth-drooling.. Delicious rice Dear..bowl and the ladle looks very cute..great click..
our family fav food.luks gr8!love the presentation.too gud! We have an award waiting for you at our space. Please do stop by to collect it. Fabulous dish and amazing presentation! 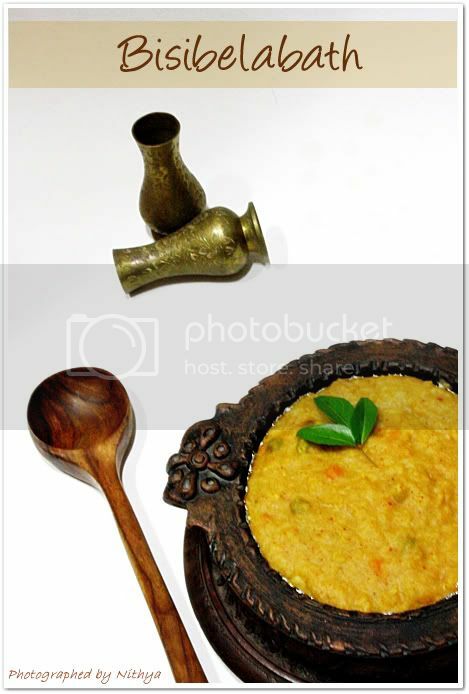 yummy sambar rice and lovely clicks! Noooooooh! Why call Bisibelabath as Sambhar Rice when the spices used for both are different! Your BBB looks just too tempting. Love that serving dish. Do you have any give-aways coming up ;) ???? ew dish to me but it sounds wonderfully aromatic and flavoursome.I love the dish you have used for presentaion its amazing. Post is great I love your blog completely but I disagree on this title. This is BBB & not sambar rice. 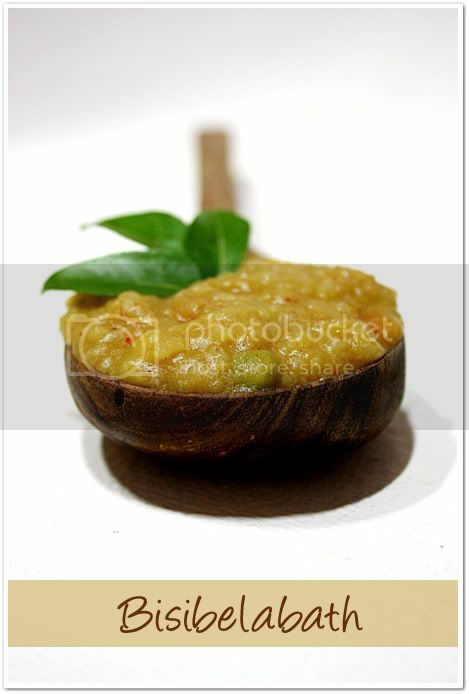 Sambar rice is like make sambar then add rice & mix. In BBB you have different spices, its freshly made moreover in karnataka jaggery is also used...thats specializes the taste of BBB. I tried the BBB today and it came out awesome. The only mistake I did was overcook the rice and dal together and came out little mushy. But the taste was very good. thanks for the wonderful recipe..